Sean Dyche has warned Brighton & Hove Albion of the unforgiving nature of the Premier League but believes the Seagulls have earned the right to be in the top flight. The Burnley manager has guided his side to as high as fourth in the league this season and they currently reside sixth after the 0-0 draw on Saturday. The Clarets’ form has shocked many in just their second season back in the division after promotion in 2015/16. Dyche, who has been in charge since 2012, knows all about what it takes bringing a team up into the Premier League, having achieved it twice in his time at Burnley. 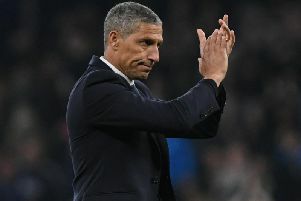 He believes that virtually anyone can slip into trouble in the league, but admits he is a fan of Albion boss Chris Hughton. Dyche said: “Brighton will aspire to what they want. We are just a version of many teams that have gone up and tried to find a way of staying in there and looking more like a Premier League side. “There are no guarantees, you can look at many teams that are currently in all kinds of predicaments in the Premier League and biggish clubs that have been in the Premier League for quite a while. It’s a really unforgiving league. “Brighton had that solid start and now they are searching for results – that’s three points in seven now. It can happen to anyone, not so much the super powers, we all know that, but from anyone else sixth down, it can happen to anyone. “I include ourselves in that, we are not the real deal. I think we have improved and are moving forwards, but we don’t take anything for granted.